An ongoing trend has seen musical artists of every stripe either being honored with or collaborating on their own beer. From rock artists like NOFX to rap artists like Run The Jewels to the freakin’ Cincinnati Symphony Orchestra, the extent to which music and beer is willing to merge apparently knows no bounds. However, though any musical act can have a beer, some embrace beer drinking more than others (we got our eye on you Cincinnati Symphony Orchestra! )—and to that end, some bands would seem more befitting of a beer than others… The Dropkick Murphys included. As a Boston-based, Celtic punk band, The Dropkick Murphys have been involved in plenty of St. Patrick’s Days and been the background music for plenty of beer swilling sessions. 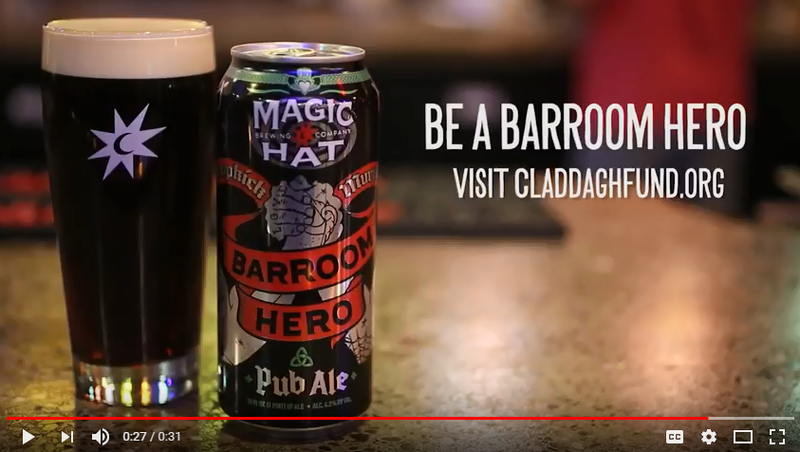 However, much like how the band’s music is about more than just being rowdy, their new beer—a collaboration with Vermont’s Magic Hat Brewing Company called Barroom Hero—also has a heart. The brew itself is described by Magic Hat as “a traditional English ‘pub ale,’ dark amber in color and with a roasted coffee aroma that invites the imbiber into a smooth caramel and chocolate malt finish.” Chris Rockwood, head brewer at Magic Hat, elaborated, “It’s genuine, with body and flavor. Not another red ale or stout.” The packaging also includes artwork from Dave Norton, a Cambridge-based tattoo artist at Pino Brothers Ink and close friend of the band. Barroom Hero will be released next month, making it available during both the band’s spring tour and St. Patrick’s Day. It will also be sold in 16-ounce cans and on draft for a limited time through the summer.